UPDATE: Ian Somerhalder announced on April 14 via Twitter that at this point in time The Vampire Diaries is not ending after Season 8. 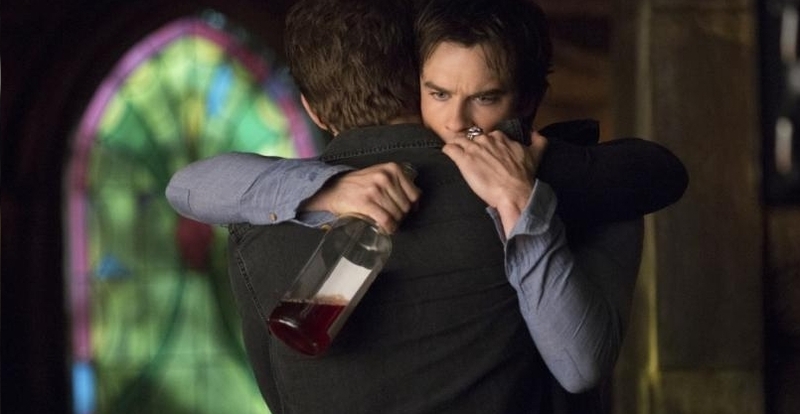 “Last weekend, I talked to an audience at a Q&A about the end of #TVD and how excited I was to make what I believe — my last year — be as great as possible,” he writes. “Somehow in my infinite wisdom and end-of-season foggy brain, I managed to make it sound like the show was coming to an end. Cut-to the press running stories that the show would be done after Season 8. I’m sure die-hard fans are heartbroken, especially since that means Damon and Stefan Salvatore just might be leaving the small screen sooner rather than later. Well, before fans cry too many tears, it hasn’t been confirmed. Reps for The CW told Entertainment Weekly that “no decision has been made” about whether or not the beloved vampire series will officially conclude after Season 8. I hate to put a damper on the good news that there is still hope for TVD to return for another season, but I’m going to say something I never thought I’d ever say and something that may upset fans: It’s time for TVD to end. It pains me to even say those words, but it’s something I’ve come to terms with. Before you become too angry with me, hear me out. I’ve been a longtime fan and one who couldn’t wait to see dark Damon, Stefan’s hero hair and how badass Caroline would become with each new episode. I would never miss an episode and, of course, had to watch each one live to avoid spoilers. Sadly, with Season 7 I have found myself dreading new episodes and losing interest in whatever is happening. As much as I still care about the original characters, I don’t care about the story lines. Not to mention, I don’t care about the new characters. I know my passion for TVD has changed, especially when I don’t live in fear of spoilers, and if I am spoiled, I don’t mind. Unlike my old self, I also let new episodes sit in my DVR for a few days before I decide to finally press play. When it comes time to watch, I only half pay attention. Now, some of you might be wondering, why don’t you just stop watching? Well, I ask myself that very same question. To be honest, I can’t bring myself to. Damon, Stefan, Caroline, Bonnie, Matt, Alaric, Enzo and whatever other familiar favorite pops up have a strong hold on me. I just can’t quit them. To be honest, I’ve had a feeling for a while that the series would be coming to an end, so I figured I might as well keep watching, since the end is probably around the corner. I’ve come this far, so why give up now? As they say, all good things must come to an end. Yes, that includes this. Like many series, I’d like for TVD to close on a high note (if it can turn around strongly in seasons 7 and 8), rather than being dragged out and continuing down a boring road. But let’s say it does get renewed for Season 9, then what? Where can it go from here? I don’t know if it can ever go back to what it once was. Obviously, series grow and adapt with time, like TVD has. However, it hasn’t grown in a positive way. At least for me it hasn’t. I also can’t forget to mention that Kat Graham said she is exiting after Season 8, which means there will be even fewer female characters. I hope (and assume) more women will be added to the show if it gets another life, but if not, I’m not sure I can keep watching. As much as I love all of the male characters (and I adore them — a lot), I don’t know if I can get on board with a lack of female empowerment. Furthermore, it seems like more and more original characters are leaving and are ready to move on to newer projects. How can TVD be TVD without the characters who made me fall in love with the series to begin with? Whatever happens or doesn’t happen, the curtains need to close on TVD before it becomes even less interesting than it already is in Season 7. Don’t get me wrong, I will be sad when that day does come, but it’s time. The Vampire Diaries airs Fridays at 8/7c on The CW.